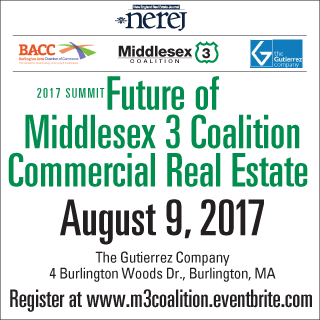 Burlington, MA The New England Real Estate Journal (NEREJ), Middlesex 3 Coalition and Burlington Area Chamber of Commerce (BACC) will hold a “Future of Middlesex 3 Coalition Commercial Real Estate Summit” on August 9. To attend please register at: https://m3coalition.eventbrite.com. Come and meet old friends, create new contacts, or learn something new during a breakfast and enjoy the 2 one-hour discussions from professionals in the Middlesex 3 Coalition market which is a regional partnership of nine Middlesex county communities, Bedford, Billerica, Burlington, Chelmsford, Lexington, Lowell, Tewksbury, Tyngsborough and Westford with the support of the Massachusetts Executive Office of Housing and Economic Development. The first panel is “Real Estate Trends in the Middlesex 3 Region. Who is coming to the region? Why are companies attracted to the area? What are the key factors in a company’s relocation decision?”, will begin at 9 a.m. Moderator is secretary of EOHED Jay Ash. The panel includes: Paul Asmar, head of real estate and property services at EMD Millipore; Jonathan Proffitt, senior director, global real estate & facilities at Kronos Inc.; Mark Reardon of CBRE; and John Boyle of Cushman & Wakefield. The second panel, “What developers, property owners and municipalities are doing to attract businesses and respond to corporate needs? Current projects, future construction plans, transportation, amenities,” will start at 10 a.m. The moderator is Robert Buckley of Riemer & Braunstein. The panel includes: Scott Weiss of The Gutierrez Co.; Andrew Gallinaro of National Development; Katie Enright of Howard Stein Hudson; Charles Reilly of Dacon; and Todd Fremont-Smith of Nordblom Co.
At 11 a.m. networking with speakers and real estate professionals begins and will conclude at noon. Over 150 professionals are anticipated to be in attendance including investors, bankers, brokers, lawyers, developers, builders, property managers, insurance agents and service and suppliers. • Venue Sponsor: The Gutierrez Company. • Vendor Sponsors: Howard Stein Hudson; Lowell Five; Nordblom; and National Development. NEREJ has fourteen summits a year in Massachusetts, Northern New England, Connecticut and NY. Upcoming summits include Construction Trends on September 28 and Hotel Summit September 6.